The fear over France’s presidential election was that the anticipated low voter turnout would help Marine Le Pen squeak across the finish line, winning another election in the Western world for angry populists (which has now become modern code for racist white people). That fear was partly true—France’s turnout hit its lowest point since the 1969 presidential election held in the wake of Charles de Gaulle’s resignation. However, at 74%, it would be the highest mark in an American presidential contest since the 19th century—when 79% of the voting age population showed up to elect soon-to-be assassinated William McKinley over William Jennings Bryan (the latter who is theorized to be the inspiration for the cowardly lion character in The Wizard of Oz). Americans haven’t even surpassed 60% turnout since the 1968 election between Richard Nixon, Hubert Humphrey and the most successful third party candidate in our nation’s history—segregationist George Wallace. Voter apathy surely has a hand in this. Over 70% of millennials do not consider themselves politically engaged or active, and a measly 7% have participated in a political or governmental-related organization. This was true of young generation Xers as well, as only 32% voted in the 1996 presidential election. Americans’ declining trust in government coincides with sluggish voting rates, and we are complicit in creating a self-fulfilling prophecy of a democracy that has abandoned us. However, our democracy certainly doesn’t make it easy for us to participate. It is incumbent upon Americans to register to vote, whereas this basic task is completed automatically in France. What is the argument against automatic voter registration? I know that we’re the country of personal responsibility, but life is busy and one shouldn’t have to wade through any amount of red tape to simply qualify for our most fundamental constitutional right. Additionally, France gets it right by holding their election over a weekend. The fact that ours is held on a freaking Tuesday is surely responsible for much of our low turnout, as people have jobs—7.8 million have two—which demand the majority of our waking hours. The country which most lionizes hard work actively discriminates against the busiest among us. And for what? Why does it seem like the day we vote is intentionally set up to suppress voting? Like nearly everything that’s fundamentally broken in America: because that’s how we did it in the distant past and we’re too lazy to fix it. Prior to 1845, elections were held whenever the states felt like it, and this led to widespread chaos. When Congress decided to mandate a uniform date, Tuesday was the option that made the most sense. In a time of horse and buggies, they had to plan around at least one day of travel—which meant that Monday was out, since our country that definitely has a separation of church and state could not interfere with the Sunday sabbath. Wednesday wasn’t an option either, as that was the day farmers would sell their product at the market. Holding it on Thursday, Friday or Saturday would interfere too much with the work week, and so our 19th century agrarian, puritan, horse-and-buggy driven society is to blame for why we vote on the most inconvenient of days in the modern age. French elections are also superior in that they elevate a wider range of voices. In America, we effectively choose between Burger King and McDonalds (except in 2016, where we chose between Jack in the Box and a dumpster in the alley filled with rotting burgers), while the French contest takes place across two rounds. To qualify for the first, one simply must gather 500 signatures from across 47,000 elected officials. Eleven candidates made the initial cut this year, and the top four vote-getters all finished within 5% of one another. Because the top two advance to the final round, this forces candidates to acknowledge the reality that they must build a coalition in order to effectively govern. In theory, our primary system is set up to do that, but since America is dominated by the upper crust of its two-party hegemony, it is expected that all losing candidates will fall in line behind the winner—no matter what. 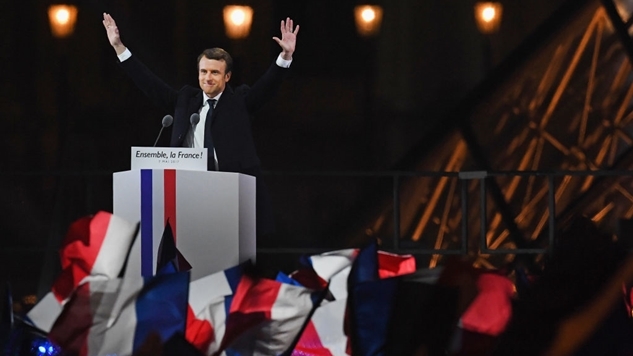 Seventy-six percent of Emmanuel Macron’s countrymen did not make him their first choice, so he must incorporate their ideas into his platform to avoid becoming a lame-duck president. Because of this setup, next month’s parliamentary elections are arguably more important than the one which took place over the weekend. In America, politics is like sports, so whatever the D or R team wants to do must be backed by the entire ideological spectrum trapped under those umbrellas, lest our officials lose any funding for their future campaigns. And this is another area where France’s system vastly outpaces America’s. France’s 2007 election saw their top two candidates spend $54 million combined. To put that figure in context, Barack Obama spent over three quarter of a billion dollars to defeat John McCain. Perhaps an even more startling figure from that year is that Ralph Nader, Bob Barr, Chuck Baldwin and Cynthia McKinney wasted over six million dollars in hopeless third party ventures for the presidency. Money—not governing skill or political acumen—is the chief determinant of who gets to govern. France does enable individuals to contribute up to $5,980 to a candidate—more than double the maximum amount allowed in America. However, they do not allow for unlimited gifts to third party groups or for the existence of PACs, and they bar special interests, businesses and unions from funding individual candidates. Our $2,700 maximum contribution is set up to look like a legitimate storefront, when in reality, truckloads of dark cash are being loaded in through the back. The French form of campaigning is vastly superior to America’s childish hero worship, as they do not allow for the attack ads which define our elections. In fact, buying air time for politicians on TV is banned altogether. Campaign expenses are capped out (to put that $54 million figure from 2007 in even more stark context, both candidates could spend a maximum of $49 million each), and the state helps to subsidize the candidates. Donald Trump is already running an ad for his 2020 reelection, and this would be illegal in France for many of the reasons listed above, but mainly for a very simple one: campaign season is limited to the five weeks preceding the election. Granted, this is not as firm a restriction as the others—as primaries for each party allow for free media coverage—but those still take place less than a year away from when people travel to the polls. Every facet of the French presidential election is geared towards policy, and America’s plays out like a cult-like reality show. Perhaps that is why they rejected a wave of far-right nationalism and fear-mongering and elected a reasonable adult, while we must endure the rule of a Boy King whose greatest claim to fame is a reality show catchphrase and a collection of bankrupt casinos. The United States grew out of the French Revolution, and we would be wise to drop the desperately narcissistic and misguided trope of American Exceptionalism that convinces us we perfected democracy. In closing, here is a French-like idea for fixing our elections that we should all be able to get behind. Oh. Should've mentioned: Election Day is a national holiday, and the Electoral College would be hurled into the sun.